Can you go back home? And if you do, will it be the same as you left it? In this classic Canadian play, Jacob (Kawa Ada) returns to Coley’s Point, Newfoundland after leaving Mary (Kayko Nguyen) without saying goodbye. In the meantime, she has become engaged to Jerome, whose father disrespected Jacob’s father. Ania Soul provides subtle music and narration to accompany this stripped-down adaptation that has no set or props except many candles. 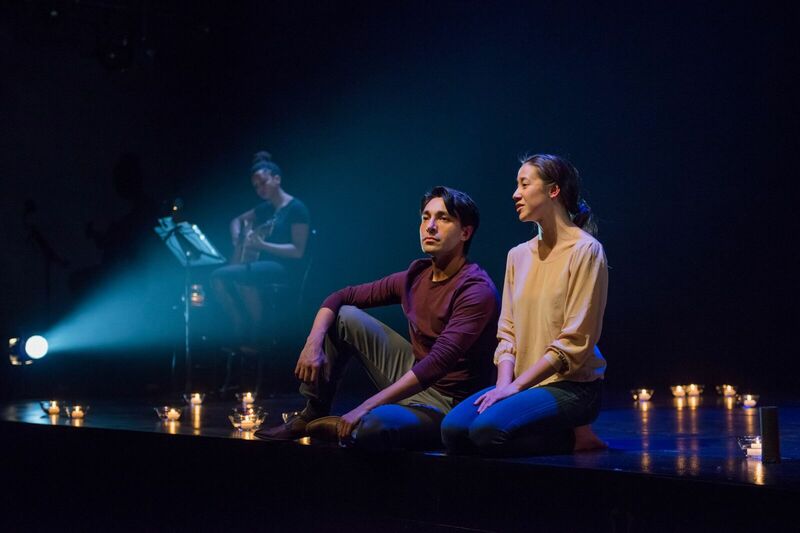 Jacob and Mary, dressed in plain clothes, stand among a constellation of candles that light up the stage, providing soft lighting that evokes their quiet, moonlit night. Director Ravi Jain has re-imagined David French’s play, set in 1926, and left only the characters and their dilemmas to be laid bare. Jacob and Mary clearly have chemistry. Their flirtatious banter and witty quips ebb and flow like the ocean lapping at their shore as Jacob tries to convince Mary not to marry the nerdy Jerome. Jacob is not convinced that Mary loves Jerome, and she struggles to say so herself. The Newfoundland accent and vintage dialect is quaint but something to get used to in the first few moments of the play. Their tense conversation draws the audience’s attention, but might be more immersive in a smaller space. Ada and Nguyen masterfully bring these characters to life as they urge us to consider the importance of love, forgiveness, and the decisions of our youth.